McBain Memorial Park overlooks Loch Ness! Questions have come to me about Loch Ness and it’s fabled monster. Most commonly the question is “have you ever seen the monster? “Had your father ever seen the monster? But lets go a little further. My father told the family a story about meeting a woman in Inverness who was a teacher at a local Primary school. Somehow the subject came up and she said “I am the most embarrassed woman in Scotland.” When asked why she said because for 16 years I have taught my students that there was no such thing as a monster in Loch Ness. Then one early bright evening (in the summer the sun stays up until 11PM or later.) I was looking at the still water of the loch when suddenly a great swirl of water and commotion was visible not far from the shore. Then I saw a hump, then what must have been a head but it looked like a huge snake head. The Monster obeyed and the swimmer was able to swim to safety. St. Columba proceeded towards what is now the town of Inverness where he was to meet with the “magicians” of the King of Scotland named Brude. The purpose of the journey was to attempt to bring Christianity to the King and his people. But that’s another story. The chronicler of St. Columba was a monk who first put the life of Columba in paper. 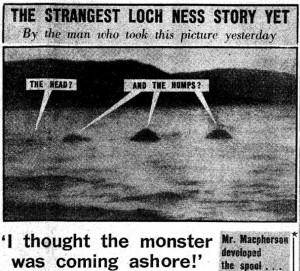 The trouble with the story is that Adaman’s account of the events at Loch Ness took place almost 100 years after it happened. The reply was that most of the history at that time was verbal or folk tales that came down from one generation to another. This was the way it was done. We assume some elaboration took place but it is all we have. Pictures of the monster which have appeared in print from around 1910 are about 60% false. But not all. can see it from our Park. Please take a while to do this but don’t forget your binoculars and camera.